Home » Website Building » SEO » What is Server Response Check in Yandex Webmaster Tools? What is Server Response Check in Yandex Webmaster Tools? Yandex offers a feature called “Server Response Check” similar to fetch as Google to help webmasters troubleshoot the pages with errors which are not indexed in the searches by YandexBot. 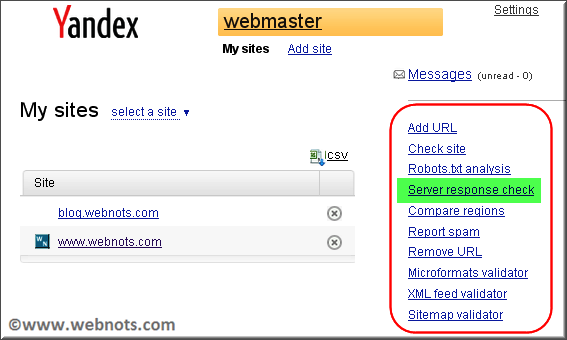 In order to use this feature you must have added and verified your site in Yandex Webmaster Tools. How to Access this Option? Once you logged in to your Yandex Webmaster Tools account, you can see the list of options available in the right side under “My Sites” section including the “Server Response Check” link. “HTTP Codes” option available under “Indexing”. “Excluded Page” option available under “Indexing”. Enter your web page URL which you want to troubleshoot. The URLs with errors can be seen under the “Excluded Pages” section. Remember to enter the correct URL with or without WWW, else you will completely get a different response. Select the Yandex indexing robot type, for web access select “Yandex main indexing robot” option from the list. Click on the “Check” button. You will see the results along with the response code. The response code will help you to analyze the error and troubleshoot accordingly. Click on the “page content” link to see the content of your page as seen by YandexBot. In case of malware affected sites the content what is seen by search engines will be different than the content what you see in the browser. This page content option help you to check what exactly the content seen by YandexBot and take corrective action.